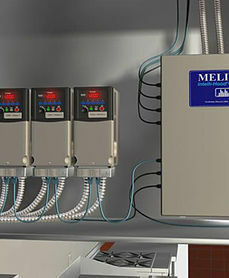 Similar to Lighting Control system, a Demand Control Ventilation for commercial kitchen hoods, an intelligent network based ventilation control solution that modulates exhaust and supply airflows to match cooking demands with the use of one central computing device. 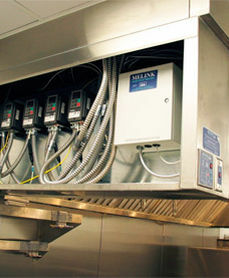 With demand control ventilation for commercial kitchen hoods, the system is employed to maximize the energy savings from the energy system, satisfy building codes, or comply with green building and energy conservation programs. The system potentially produces savings from reducing heating and cooling, savings up to 90% in fan energy and 50% in conditioned air. 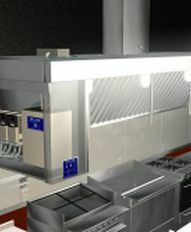 Demand control ventilation for commercial kitchen hoods optimizes energy efficiency by reducing the exhaust and MUA fan speed. The technology accomplished by leveraging sensors to determine the minimum amount of exhaust air required to capture and contain effluent from the cook line. This new technology is applicable in buildings with large kitchen facilities such as a hospital, school, prison, housing, hotel, theme park, sports stadium, country club. The system measures the temperature, steam, and smoke under the hood, it also adjusts the fan speed accordingly to save both fan energy and conditioned air. 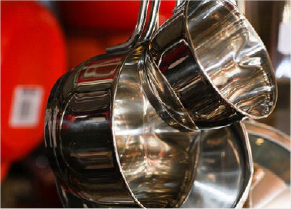 During actual cooking, the speed increases as needed up to 100% until smoke and vapors are removed, keeping the kitchen environment temperature comfortable.